Carolina Academic Press will publish the fifth edition of Richard Wydicks Plain English for Lawyers in time for use in the fall of 2005. Wydicks little book has been a favorite of law students, legal writing teachers, lawyers, and judges for over 25 years.Last January, the Legal Writing Institute gave Wydick its Golden Pen Award for having written Plain English for Lawyers. The Legal Writing Institute is a non-profit organization that provides a forum for discussion and scholarship about legal writing, analysis, and research. The Institute has over 1,300 members representing all of the ABA-accredited law schools in the United States. Its membership also includes law teachers from other nations, English teachers, and practicing lawyers.The LWI award states: Plain English for Lawyers . . . has become a classic. Perhaps no single work has done more to improve the writing of lawyers and law students and to promote the modern trend toward a clear, plain style of legal writing. In 2003 Wydick retired after 32 years on the law faculty of the University of California, Davis. But he still teaches his favorite course  a seminar in advanced legal writing for third-year law students. For the past eight summers he has also lectured at the International Legislative Drafting Institute presented in New Orleans by the Public Law Center, a joint venture of Tulane and Loyola law schools. There the audience consists of lawyers and non-lawyers from abroad who earn their living drafting legislation in many different languages. 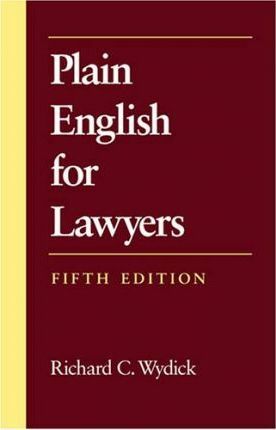 Teaching at the Institute, Wydick says, is a precious opportunity to learn how much we English-users have in common with people who write laws in other languages. How will the fifth edition of Plain English for Lawyers differ from its predecessors? Wydick promises that it will remain a little book, small enough and palatable enough not to intimidate over-loaded law students. Most of the text will remain the same, Wydick says, but in the past seven years Ive learned some new things about writing in English, and I want to share that with the readers. In addition, the exercises at the end of the chapters will be different (a welcome change for long-time teachers who are tired of the old ones). Finally, the teachers manual will include additional exercises that teachers can give to students who want or need extra practice.